As a condition of joining the Happy Coffee team, each member agrees to host a race. 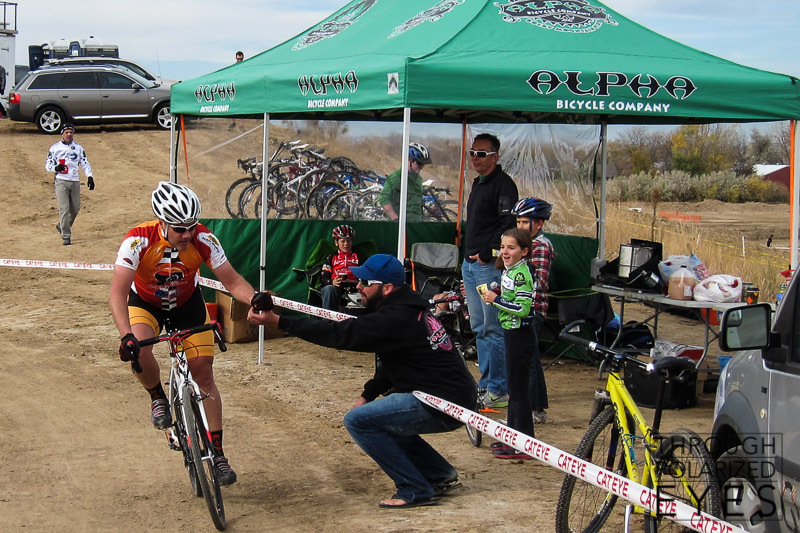 This same race last year was my favorite (despite the broken chain), so I volunteered Lauren and myself to make sure a good time was had by all this weekend. This year’s race schedule has had the SW4 class (Lauren’s category) starting at 8am. 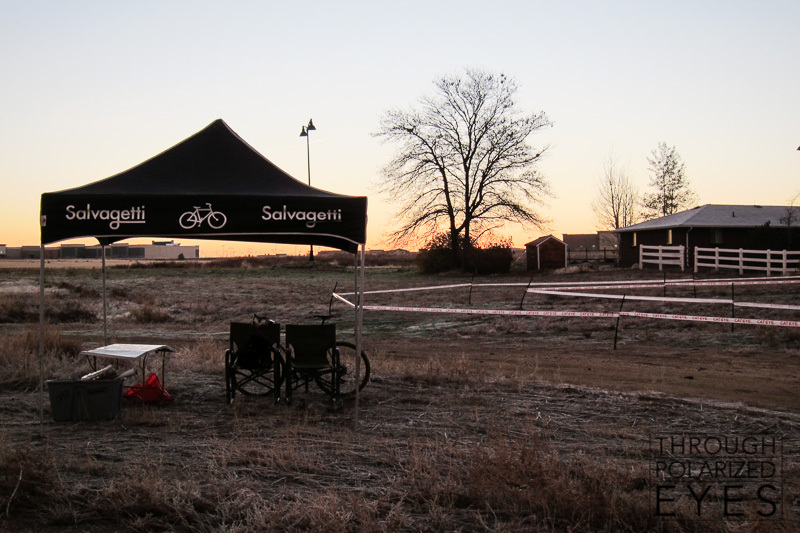 Setting up meant an even earlier start to the day for us, and we were on-site putting up the tent in the pre-dawn, sub-freezing temperatures as frost grew on our bikes, car, table, the grass… everything, really. 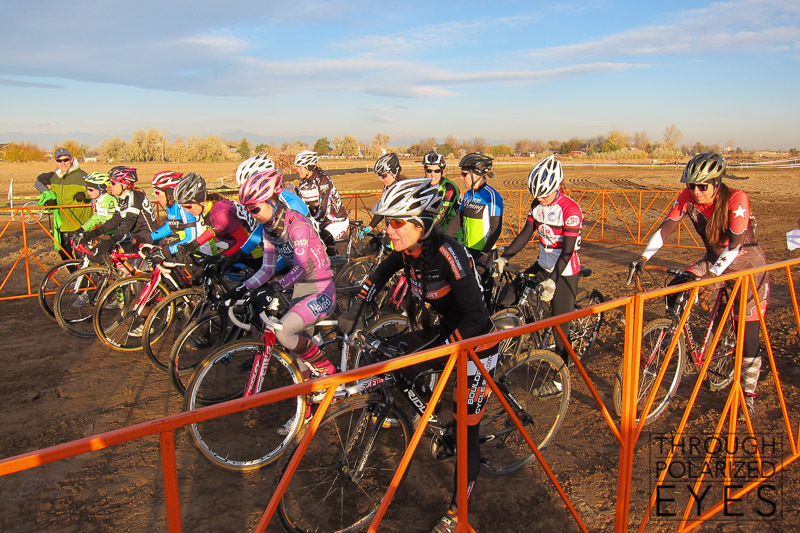 After a little pre-riding to learn the course and try to warm up, it was time for the first races of the day – SM55+ (old guys) and SW4. Larry Grossman (racing announcer extraordinaire) lining up was an unexpected surprise, and he did quite well – although no one was a match for Gary Thacker. The ladies lined up, ready for 40 minutes of suffering. The soil at this venue is a very sticky clay. Last year, derailleurs were snapping left and right. 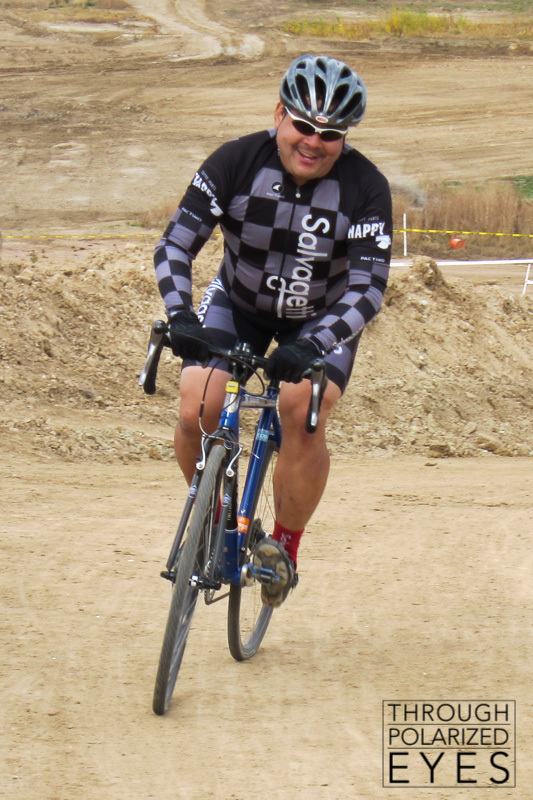 It was slightly drier this year, so the only thing that packed in with dirt were shoes and pedals. With an inch of clay covering her shoes, Lauren gave up trying to clear them. 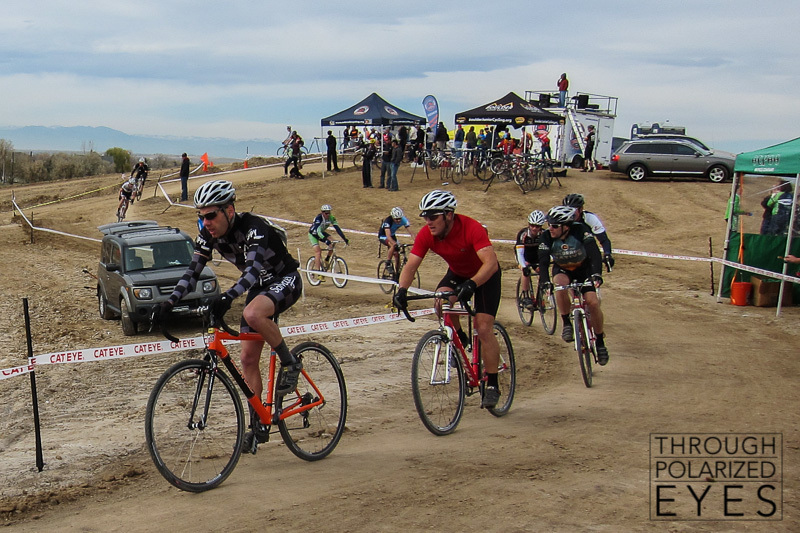 Before the SM4 race, the entire field was trying to clear mud from their shoes and pedals, to no avail. 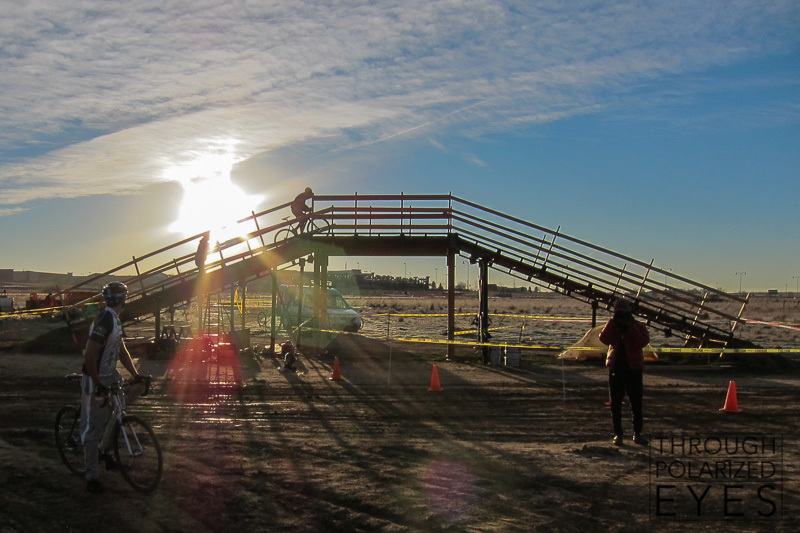 As soon as racers stepped off their bikes for a run-up, their shoes were immediately coated in clay. 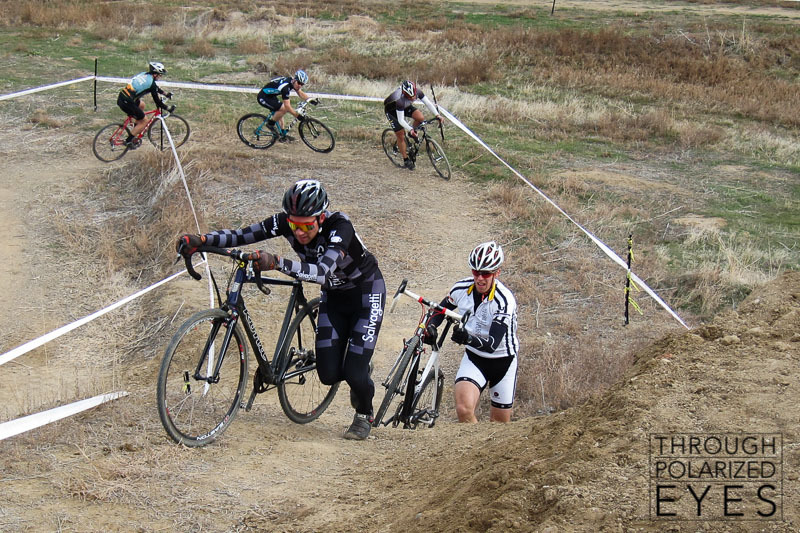 I spent about 1/3 of my race trying to get clipped back in, which isn’t a good recipe for putting power down. 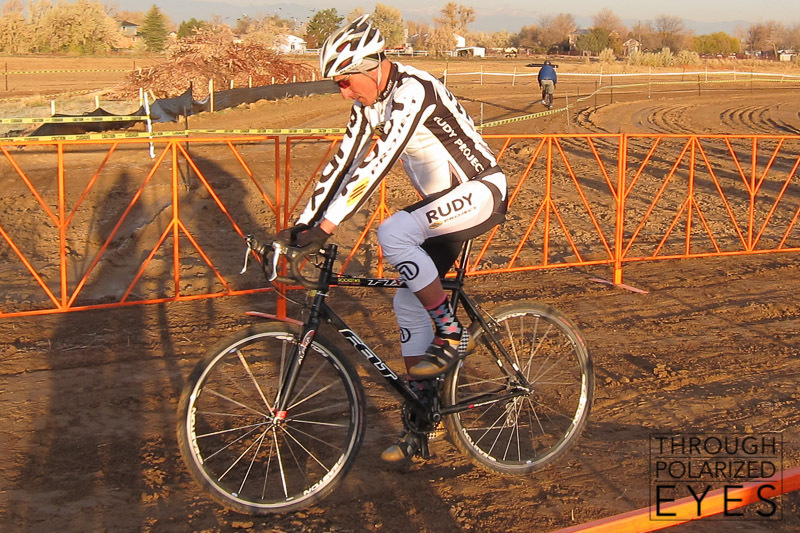 By the later races, the course was dry, fast, and smooth. This run-up even became rideable (by some) later in the day. 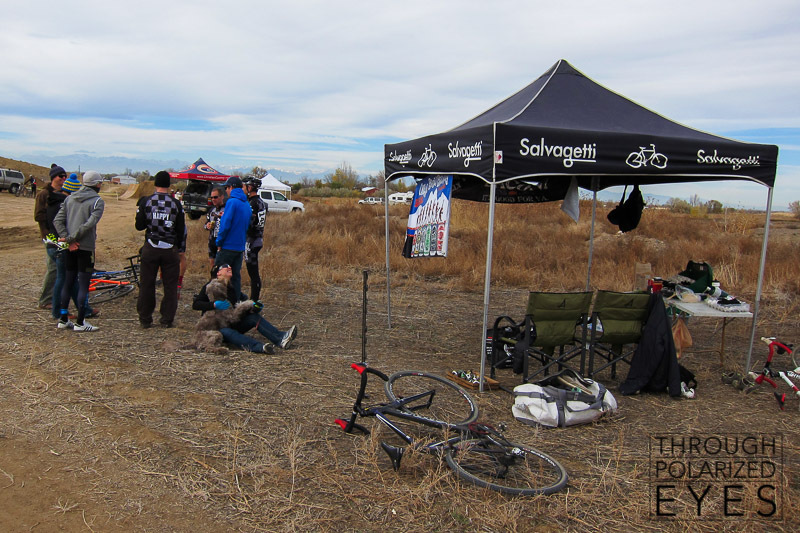 Alpha Bicycle Company’s team tent was a welcome site, as they enthusiastically did beer, hot dog, and bacon handups. 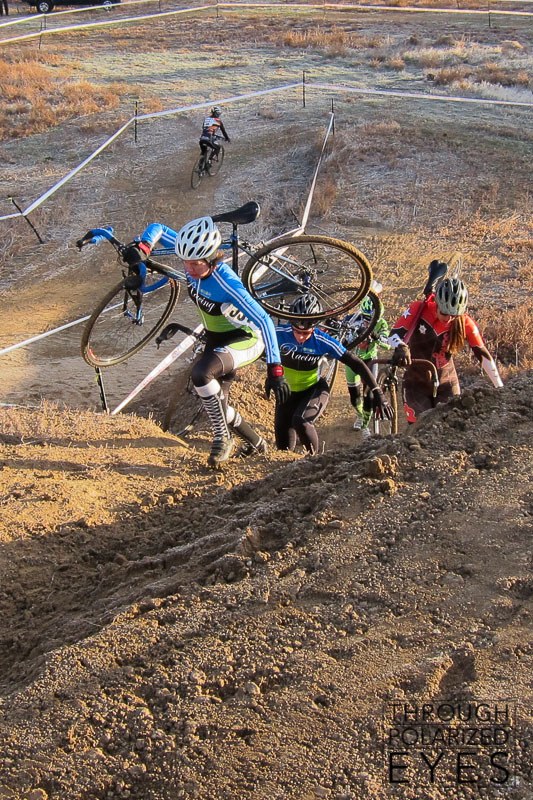 Cyclocross is supposed to be fun, and too many people out here forget that. 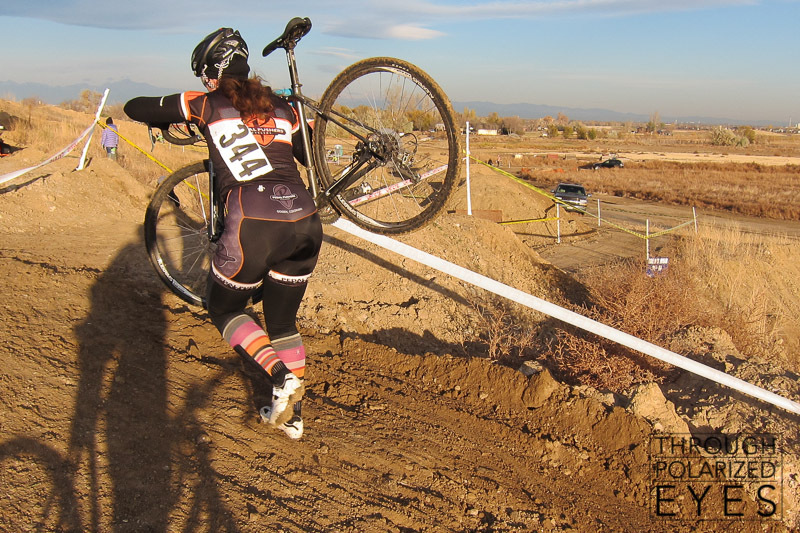 Most racers looked disgusted at taking a bacon hand-up mid-race, and they were met with hearty heckles. “There’s no team I like better than Happy Coffee…for a lot of reasons.” – Larry Grossman. 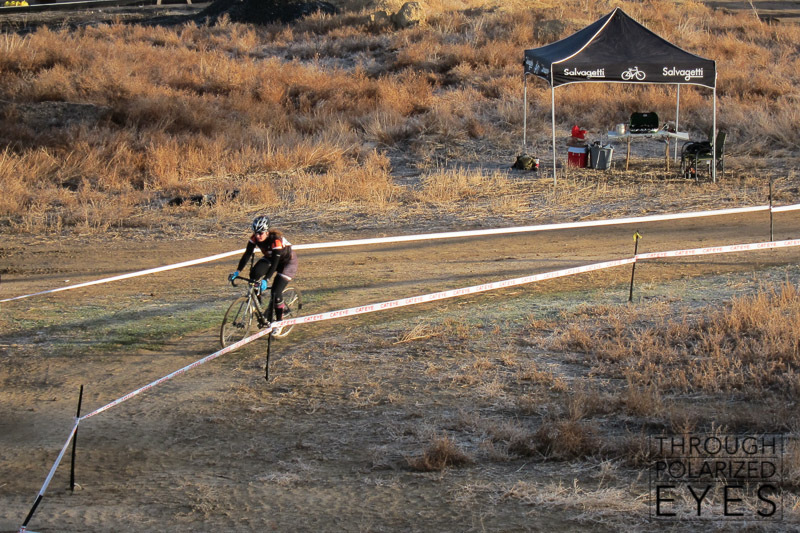 CX is about fun, friends, beer, and pain. Larry knows the score. After our races were all done for the day, it was back to the tent to cook more breakfast tacos and have a few beers. A HUGE thank you goes out to Oskar Blues Brewing and Tender Belly for supplying the beer and bacon (respectively). I’ve said it before, and I’ll say it again: cans are way better than bottles for transporting and drinking beer. And the bacon from Tender Belly is, without a doubt, the best bacon I’ve ever had. And one more thank you goes out to Icebreaker. 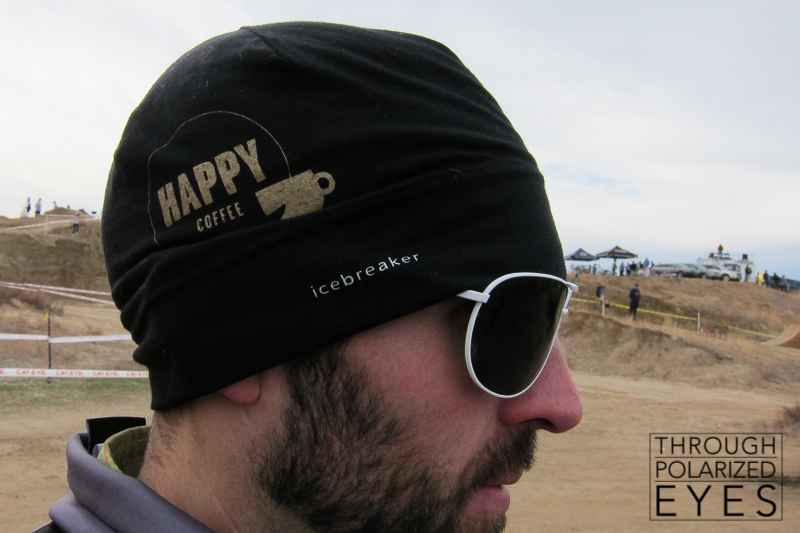 They surprised us (or at least me) with some merino skullcaps with the Happy Coffee logo. It was perfect for keeping my head unfrozen during the race, and I know it’ll be getting plenty of use this winter.